The Eterra® Dozer-Grader attachment excels at high-performance grading. Even delicate tasks can be completed with powerful precision however this Grader is designed for even the toughest tasks a grader might face. Eterra has taken the industry standard laser-grader attachment, beefed it up, and added innovative technology to increase your productivity. Not only that, but they've added a ton of versatility. The Dozer-Grader features an ultra-duty dozer-blade that moves six different ways to grade any surface, big or small. What's even more valuable to the operators of this attachment is it's ability to raise and lower the stabilizer boom so it becomes a fully-functional Dozer blade - Now that's versatility. It doesn't make a difference if your machine is a Bobcat, Caterpillar, Kubota, John Deere or any other brand of Skid Steer or Compact Track Loader. Skid Steer Solutions has partnered with Skid Steer Genius to make sure your machine is compatible using Skid Steer Genius Super Controllers. Laser Masts (2): Laser Masts are required for your laser system to work properly with the Eterra Laser Grader. Laser Receivers with Slope Control Box and Slope Sensor (2): Complete system with external visual controller, and manual slope adjustment. Slope Control Box (1): This control box can be added separately and operated by itself. This control box allows the operator to set the level they wish to grade to and run the Dozer-Grader without additional receivers. Bolt-on End Wing Kit: Helps to carry more material when fine grading or spreading materials such as sand or gravel. This feature allows the Dozer-Grader to go from a grading attachment, into a box blade, eliminating the need for an additional attachment. Hydraulic cylinders independently adjust each side of the moldboard, as well as angle the moldboard. 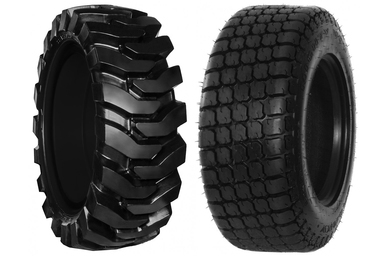 Tires on the front of the Dozer Grader provide excellent flotation to keep the grader moving smoothly over the work area. Automatic operation of the grader can be gained when paired with the laser control system. With a laser system, precision grading over a much larger area can be gained when operating in a much larger area. Skid Steer Genius Super Controller: SSG Super Joystick Controller (Either permanent or temporarily installed). Used as a stand-alone grader or dozer the DGR-106 is an optimal attachment allowing the operator the full flexibility of being able to spread and final grade all with one attachment. Dozer Style Mold Board: This is not your typical Skid Steer Grader Mold Board. It's thicker, it's more reinforced, and it's taller so that you can get more aggressive with large piles of material you need to push, move and spread. Proportional Hydraulic Valve: Using the latest in technology, the DGR-106 hydraulic control valve offers the ultimate in precision control. Blade Extension turns the grader from a 86" grader into a 106" grader. Laser-Ready! Need help understanding how this amazing technology works, please contact us during our hours of operation (chat, ask a question, call, email) and we will set you up with a product expert that can help you get started. Expand your capabilities with the plug-and-play system, you’ll save time, fuel, and money with millimeter accuracy. DGR-106 grader featuring SSG Super Joystick Controller (Either permanent or temporarily installed). Used as a stand-alone grader or dozer the DGR-106 is an optimal attachment allowing the operator the full flexibility of being able to spread and final grade all with one attachment. Rotating Laser (Either Operator or Eterra Supplied) – This provides a level light plane over the job site and allows the grader to have a constant level reference plane from which to guide the blade. A job site rotating laser must have a 360 degree rotation and be bright enough to be seen over the entire working area or the grader will not work properly. The blade can be either guided manually by watching the arrow indicators on the masts and the control box or by using the auto mode whereby the controls take over and no operator intervention is needed. Laser Receivers – Mounted at the same height on both sides from the base of the blade, allows a determination between the laser reference and the blade reference. A visual indicator will show the operator if either of the blade sides is higher or lower than the required grade. In manual mode, the operator will adjust the blade height in accordance with the receiver indicators to create a level grade and in auto mode the controls will take over and maintain the grade automatically. Control Panel – Connected between the receivers and the hydraulic valve assembly, it processes the data from the receivers and provides a visual indication of the actual position of the grader. It also gives the operator to change slope angles minutely with the turn of a dial as well as allow manual/auto operation. Essential Equipment is what we stand for. Seeing the prices for traditional grader attachments made us cringe when we saw the price tags. We believe in creating value for our customers with attachments that can do the work, not just some of it. The Dozer-Grader®️ is the next evolution or grading attachments and we're excited to see more customer jobs getting completed in 2019. Visit www.eterra-usa.com to request a quote or more information. Skid Steer Solutions, Inc. offers a 1-Year Limited NO-HASSLE Warranty on all attachment products and their accessories purchased from our website SkidSteerSolutions.com, please visit our warranty page for full details. Our warranty on parts and wear parts is dependent upon the manufacturer's warranty. Please visit our warranty page for more information. To learn about our returns policy, please visit our Shipping and Returns page for the full details.